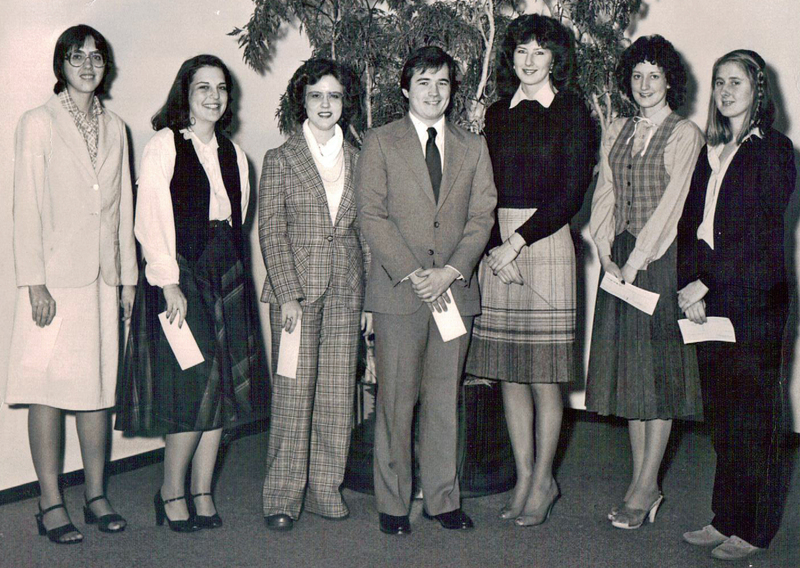 Scholarship Winners: Patricia Visnesky, third from left, and Cynthia R. Baksys, far right. Can you identify others in the photo? Patricia Visnesky (third from left in photo). Dr. Visnesky grew up in Springfield and graduated from what was then Sacred Heart Academy in the class of 1977. Her Fr. Yunker Scholarship was applied to college costs at MacMurray College in Jacksonville, where she earned bachelor’s degrees in chemistry, biology and mathematics. Today Dr. Visnesky is a clinical assistant professor at the SIU School of Medicine. She has been a practicing obstetrician-gynecologist in Springfield for 26 years, since her graduation from Loyola University of Chicago Stritch School of Medicine in 1986. Dr. Visnesky completed her residency at SIU School of Medicine and St. John’s Hospital, Springfield, where she served as Chief Resident and focused her studies on high-risk obstetrics and gynecologic oncology and infertility, including laser laparoscopy, hysteroscopy and colposcopy. She has been board certified in obstetrics/gynecology since December 1992. Cynthia R. Baksys (right edge of photo). Cindy’s $1,000 scholarship went towards her expenses at the University of Illinois Urbana-Champaign, where she earned a general engineering degree in 1981, one of the first in her family to complete college. Cindy has been an engineer with the U.S. Army Corps of Engineers, Sacramento, CA, for 31 years, and is currently the most senior project engineer in her office. She prefers working in the field, and has performed construction management and quality assurance on major barracks, warehouse, office, aircraft hangar and maintenance building construction projects, as well as waterway dredging and road and parking lot paving projects. She has been awarded the Corps’ coveted Hardhat of the Year Award for the South Pacific Division. Cindy grew up in Springfield with her five sisters, attending Blessed Sacrament grade school, Sacred Heart Academy and Southeast High School. She is an avid gardener and has collected and planted more than 200 trees, shrubs and flowers, including 10 sage varieties, at her Sacramento Delta home. She lives in a log house she built and landscaped with her husband, Jay, which is also home to a steady stream of beloved rescue dogs and cats.